Yes, Tori, now. When Tori woke up this morning I grabbed her, and held her tight and told her "Happy birthday, Tori!" She looked and me and said, "Now?" "Yes, honey now." "Now I'm four?" Yes, honey, now, you're four." Happy birthday Victoria Melody Joy. We love you and enjoy every day with you. You bring so much joy and laughter into our lives. We can't imagine what our family would be like without you. This photo was our first introduction to Tori. 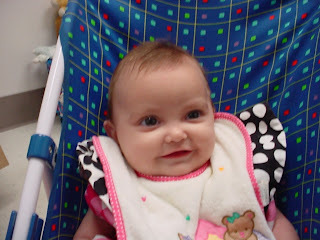 Tori is apx 6 months old here. We brought her home when she was 8.5 months old. This is our beautiful girl now...4 years old! What a blessing she is! Here are some fun pictures of Tori from this last year. She was a very busy three-year-old! Kevin has the kitchen in pretty good shape. Cabinets are in, the countertop is poured, appliances and the sink are in. He has done a beautiful job, it looks great! We still have to complete the floors, paint and do some finish work, but, all in all, we're very pleased. 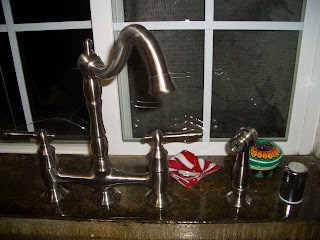 During the chaos of the kitchen remodel, the kids particularly enjoyed the chaos. All three kids would play hide-n-seek in the cabinets, or peek a boo with a towel and a stack of laminate flooring. They were pretty creative! Phase 2 of our kitchen (phase 1 was demolition and placing the big beam!) had Kevin tearing out the remaining cabinets and building walls. Part of the process also included enclosing part of the garage to be an 'addition' to the kitchen for a laundry room. (one of my favorite parts!) So far, he's taken out a false ceiling, and two walls...built three walls and rebuilt a half-wall. He's rewired the kitchen, built a dormer (with soon to be skylight) and installed cabinets and appliances. I picked out a few photos to show progress. 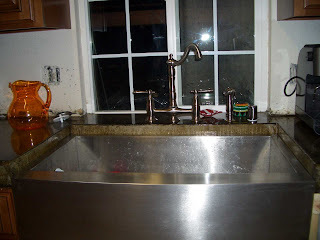 The last photo shows my least favorite part of the remodel, washing dishes in the bathtub...good times! Kev started demolition on Jan 3 and installed the last appliance, on March 31. I say three months is an excellent pace for doing most of the work by yourself! Hard to believe that eight years ago today I gave birth to our oldest daughter, Elizabeth Grace. She has grown into an amazing young lady. She loves to laugh, play with her sister and brother, READ, play softball (a new venture for her! ), play with cousins, play with mom and dad, watch TV with Nana (she likes Rachel Ray), make new friends and she loves school. We feel so blessed that God choose us to be the parents of Lizzie. Nine years ago I was drowning in infertility woes and depression. Now, I find it hard to believe that I'm a mother of three amazing children. Happy Birthday Lizzie! We love you! Tori checking out Lizzie's new (groovey) mitt. Side note from today: Joshua enjoying his first zweibach! This past Sunday we dedicated Joshua at Flipside. For those of you unfamiliar with child dedications, we stood before our congregation and promised to raise Joshie in a way pleasing to the Lord. The congregation also agrees to support us in this effort. We waited until we finalized Josh's adoption. It was a very sweet moment. We were surrounded not only by our church family, but we had friends and family join us for the day. Thank you to everyone who was able to help us celebrate this awesome day. The photo isn't great, but it'll have to do!